The "Newt" in this banner doesn't necessarily refer to Newt Gingrich. When confronted with years of racist, homophobic, and just plain crazy rants in the pages of his now-defunct newsletter, Ron Paul claims that he wasn’t the author, even as he seems unable to come up with the name of the newsletter’s, ahem, true author. As for the 1993 direct mailer — this one bearing Ron Paul’s signature — that warned of a “coming race war” and a “federal-homosexual cover-up on AIDS,” Paul claims he didn’t write it either. 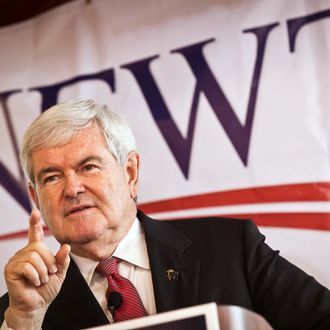 It’s not clear whether anyone is buying it — especially since Paul repeatedly admitted to writing the newsletters during his 1996 congressional campaign — but Newt Gingrich seems to think Paul’s strategy is a good one. The Wall Street Journal reports today on a memo from April 2006 on the website of Gingrich’s Center for Health Transformation. In the memo, filed under the “Newt Notes” column and written in the first person, Gingrich calls RomneyCare the “most exciting development of the past few weeks” and says he “agree[s] strongly” with the “principle” of the individual mandate. That Gingrich supported the individual mandate in 2006 should not come as a surprise — the mandate was originally a conservative idea, and was embraced by Gingrich as far back as 1993. Of course, after the mandate was embraced by the Democrats in their health-care reform plan, it was suddenly and swiftly denounced by the Republican Party as the worst form of government tyranny. These days the mandate, and by extension RomneyCare, are treif in GOP orthodoxy. What to do, then, about this memo? [Gingrich spokesman R.C.] Hammond said the Newt Notes essay wasn’t written by Mr. Gingrich himself. Hammond did not identify the — ahem again — true author of Newt Notes, but it was probably the same mysterious writer who penned “Ron Paul’s Freedom Report” and hacked Anthony Weiner’s Twitter account.